Does Apple's new 'Why iPhone' website prove it is running scared? 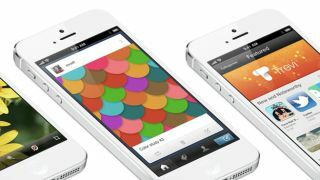 New microsite lists how iPhone beats Android rivals. They say the best defence is a good offence and Apple has attempted to reassert the superiority of the iPhone 5 with a new website outlining how the device still smacks down its high profile Android rivals. The new 'Why iPhone' portion of Apple's website, launched on Saturday, just two days removed from the Samsung Galaxy S4 launch, explains why "there's the iPhone and there's the rest." It touts hardware design, customer satisfaction awards, the togetherness of iOS over Android, the safety and selection offered by the App Store and the quality and popularity of the iSight camera, among other features. It's a somewhat unexpected and defensive move from Apple as the company hasn't felt the need to defend the iPhone against rivals in its marketing materials, rather letting the features speak for themselves. Is Retina still the gold standard? The defensive nature of the campaign is outlined by the praise Apple lavishes upon the iPhone's Retina Display. It explains that only the iPhone and other Apple products have the Retina Display, and claimed that the iPhone "ushered in the era of super hi-res displays." However, the iPhone 5's 1136 x 640 resolution and 326 ppi pixel-density have been bested by the 5-inch, 1080p HTC One, Sony Xperia Z and Samsung Galaxy S4 handsets, that all rate above 440ppi. And while it's true that only Apple products have one, for all intents and purposes, 'Retina Display' is a marketing term rather than a technological advance that consumers should be coveting. The site, which is also bullish about the iPhone 5's battery life and the power of its A6 processor, also touts the merits of the iPhone's rear-facing 8-megapixel iSight camera. It calls it "the world's most popular camera," citing the fact that the iPhone 4S, iPhone 4 and iPhone 5 are the top three cameras used to upload photos to Flickr. "While other smartphones simply tout large amounts of megapixels, taking great pictures is about so much more," the company says, in response to 13-megapixel offerings from its Android competitors. Apple also makes clear that its status as the hardware and software manufacturer keeps everything perfectly integrated, while the threat of malware is seen off by a stringent App Store approval process. Finally, it outlines the support system, claiming that any problems with the iPhone can be handled through its own in-store, online and telephone channels, rather than seeking assistance from multiple parties. The post reads: "With other smartphones, you're not sure where to go for help. Call the manufacturer, and they tell you to call your service provider. Call your service provider, and they tell you to contact the OS developer. Getting answers shouldn't be that hard. And with Apple, it never is." It certainly seems that Apple's marketing team has decided to go on the offensive in order to protect its territory against a swathe of ever-improving, well-hyped and critically acclaimed Android rivals. With the iPhone 5 only half way into its annual life-cycle, perhaps its a smart, well-timed play to outline the perceived superiority of that device? What are your thoughts on Apple's shift in strategy? Is it running scared or just throwing out a few truth bombs? Let us know in the comments section below.